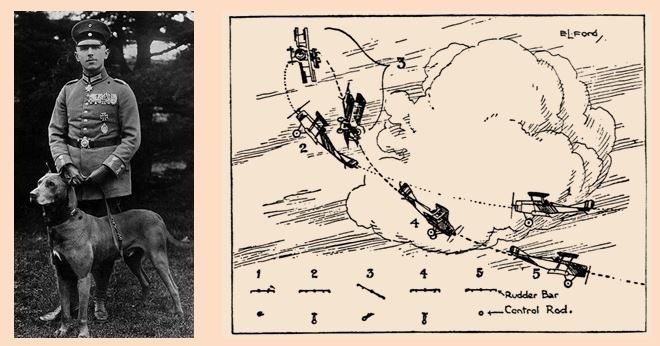 Max Immelmann, and on the right an artists sketch of the incredible manoeuvre that he perfected in combat. On September 21st, my birthday, I took off at 9 a.m. in my Fokker monoplane. I had no special orders, but wanted to protect a machine of our section which was putting our artillery on to newly located objectives by telegraphic signals. These artillery fliers are often disturbed by enemy fighters and must then retreat, because their only weapons are automatic carbines. So I make arrangements with the crew of the other machine about the spot where we shall cruise. At 9.45. a.m. I fly my circles over Neuville village, as agreed. I am 3,100 metres up, and cannot see the other machine, which has arranged to climb to 2,500. That does not matter; it will certainly be there. The only trouble is that I cannot see it; probably masked by my wings. I go round and round, for a whole hour. The business begins to be a bit boring. For a long time I have been looking out on my right; when I peer out to the left again, I see - quite close behind me on my left - a Bristol biplane which is heading straight for me. We are still 400 metres apart. Now I fly towards him; I am about 10-12 metres above him. And so I streak past him, for each of us had a speed of 120 kilometres an hour. After passing him I go into a turn. When I am round again, I find he has not yet completed his turning movement. He is shooting fiercely from his rear. I attack him in the flank, but he escapes from my sights for a while by a skilful turn. Several seconds later I have him on my sights once more. I open fire at 100 metres, and approach carefully. But when I am only 50 metres away, I have difficulty with my gun. I must cease for a time. Meanwhile I hear the rattle of the enemy's machine gun and see plainly that he has to change a drum after every 50 rounds. By this time I am up to within 30 or 40 metres of him and have the enemy machine well within my sights. Aiming carefully, I give him about another 200 rounds from close quarters, and then my gun is silent again. One glance shows me I have no more ammunition left. I turn away in annoyance, for now I am defenceless. The other machine floes off westward, i.e., homeward. I am just putting my machine into an eastward direction, so that I can go home too, when the idea occurs to me to fly a round of the battlefield first, for otherwise my opponent might think he had hit me. There are three bullets in my machine. I look round for my 'comrade of the fray', but he is no longer to be seen. I am still 2,500 metres up, so that we have dropped 600 in the course of our crazy turns. At last I discover the enemy. He is about 1,000 metres below me. He is falling earthward like a dead leaf. He gives the impression of a crow with a lame wing. Sometimes he flies a bit and then falls a bit. So he has got a dose after all. Now I also drop down and continue to watch my opponent. It seems as if he wants to land. And now I see plainly that he is falling. A thick cloud rises from the spot where he crashes, and then bright flames break out of the machine. Soldiers hasten to the scene. Now I catch my first glimpse of the biplane I intended to protect. It is going to land. So I likewise decide to land, and come down close to the burning machine. I find soldiers are attending to one of the inmates. He tells me he is the observer. He is an Englishman. When I ask him where the pilot is, he points to the burning machine. I look, and he is right, for the pilot lies under the wreckage - burnt to a cinder. 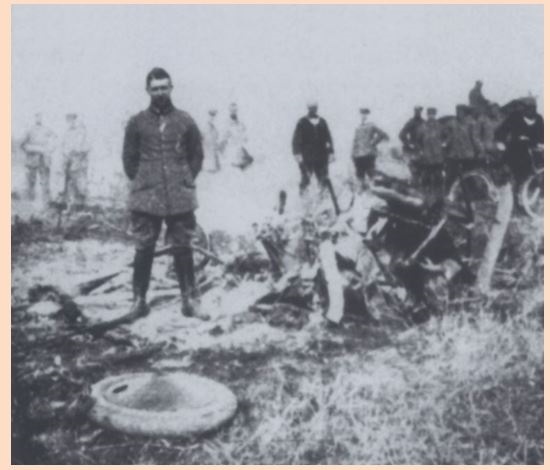 Immelmann, as described in his own words, standing alongside the wreckage of Stanley's aircraft. The observer is taken off to hospital. I fly off again, to the accompaniment of rousing cheers from about 500 soldiers. When I reach home, the men of the section lift me out of the machine and carry me (on their shoulders) to my tent with loud hurrahs. Later on I visited the prisoner in hospital. He told me I had hit the machine many times without doing too much damage until at last I killed the pilot instantaneously with a shot through the neck, whereupon the machine fell. When it crashed, it took fire, and he was hurled out in a high parabola. That saved his life, and he only sprained his feet and back. He said he fired about 400 rounds and was astonished at not hitting anything. That is more or less a picture of an airfight. Stanley Winther Caws was the first Canadian airman to be killed in action. Caws was Canadian by choice, having been born on the Isle of Wight and, at thirty-six, was unusually old to be flying in the RFC. Returning to Edmonton, he enlisted in the 19th Alberta Dragoons and went overseas with the First Contingent. In February 1915 he transferred to the RFC. "He had the disconcerting habit, while we were waiting for the next course to be brought in, of suddenly snatching up any table-knives within reach, and slamming them, one after the other, across the room, into the woodwork of the door. "Manners were more stereotyped in 1915 and a man like Stan Caws must have impressed the sheltered eighteen- or twenty-year-olds with whom he was thrown into such close contact. Perhaps his peculiar social graces help to explain how Canadians in the RFC got their reputation for unorthodoxy and mild rowdyism in a service where unorthodoxy and mild rowdyism were a way of life." Stanley was no Canadian by birth but clearly was in spirit and he is remembered on several memorials across the country, particularly the National War Memorial in Ottawa, in addition to those on the Isle of Wight and at Arras in France. It is recorded in several places by witnesses to the event that the Germans buried Stanley with full military honours close to the place where his aircraft struck the ground. Sadly the ravages of a further three years of war obliterated any trace and to this day Stanley remains there, unknown and untended. Stanley was clearly a man of wild pursuits and not of his father's demeanour, but if any rift existed between them its thaw is evident in the pleading words Douglas wrote when appealing to the authorities for information during those difficult few weeks between his going missing and his death confirmation. Douglas passed away at the Westwood Nursing Home, West Street, Ryde in October 1932. Harriet's death followed twelve months later. Stanley's eldest sister Dora never left the Island and appears never to have married, serving most of her working life as a midwife. She passed away at Upper Orchard, Seaview in February 1948. Fernand Charles Butler, as mentioned in the previous page, married the next eldest sister Hilda. Having been Stanley's closest companion through the Boer War, the rough days in Stanger, the Frontiersmen and the Dragoons is seemed odd that he didn't share his friends ambition when leaving the Canadian Expeditionary Force to fly with the RFC in early 1915. It was therefore with a wry smile that I discovered he was commissioned as a flying officer of the Corps just eight days before Stanley's last flight. Following the war he and Hilda returned to Canada. After Fernand's premature death Hilda headed back across the Atlantic and passed away on the Isle of Wight in early 1967. Thanks to the vivid recollections of former Newport fireman Maurice Young we also know that having returned to the Island Hilda worked as a secretary in the Isle of Wight Fire Brigade's Fire Prevention department. Maurice described Hilda as a lovely lady. Of his two younger sisters Constance married in 1914 and after the war set up home with her husband in Norfolk. She finally passed away in 1983 in Lincolnshire at the grand age of 96. It is interesting to note that she visited Canada just once, but not until 1959. Youngest sibling Alison, who had just turned twenty when Stanley went missing and who wrote so pleadingly for information about him, sailed aboard the SS Medina as a chemist, departing London bound for Port Said, Egypt, on 1 September 1916. No further references to her life have been discovered.